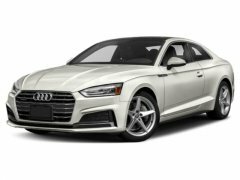 Find a great sale price on this 2018 Audi A5 Sportback 2.0 TFSI Premium Plus at Keyes Cars in CA. This 2018 Audi A5 is located at our State dealership in California. We serve the cities of Van Nuys, Valencia, Woodland Hills, Mission Hills, and Los Angeles. So if you're looking for a great price on this 2018 Audi A5 Sportback 2.0 TFSI Premium Plus or just looking to get an auto loan for the vehicle you want... you've come to the right place! Keyes Cars. The all-new Audi A5 Sportback features an elongated power dome hood that nods to the impressive engine underneath, while its newly available sleek sportback body type expresses an elevated design language that speaks volumes. And with its available driver assistance technologies, it's sophisticated and sporty as well. The allure of the Audi A5 Sportback is undeniable. A striking exterior captures attention from onlookers, while the ample, amenity-filled interior rewards those on the inside. The tilting and sliding panoramic sunroof offers both the front and rear passengers a virtually unobstructed overhead view while flooding the cabin with natural light. With 273 lb-ft of torque, the 252-hp turbocharged engine mated with the seven-speed S tronic dual-clutch automatic transmission can drive 0 to 60 mph in just 5.6 seconds. The quattro all-wheel drive system sends power to the wheels with the most grip, helping to enhance traction and handling performance on a variety of road conditions. The available Audi virtual cockpit is a fully digital 12.3-inch information cluster that communicates information such as available navigation, audio and compatible phone, offering classic and infotainment modes as well as Google Earth or Google Street View screen options. The available Bang & Olufsen sound system with 3D sound provides exceptional, clear, multidimensional acoustics and features 19 speakers, 16-channel amplifier and 755 watts of power. Audi pre sense city can detect cornering and stationary vehicles and pedestrians at speeds of up to 52 mph and alert the driver to a potential collision, reduce speed by up to 25 mph and apply automatic braking to help minimize or prevent a collision.